Preheat oven to 350 degrees F. In a medium bowl combine crushed pretzels and the 1/3 cup sugar. Add melted butter and stir well to combine. Press onto bottom of a 13x9x2-inch baking pan. Bake in the preheated oven for 10 minutes. Let cool on a wire rack. In a large bowl beat the cream cheese and 1 cup sugar with an electric mixer on medium speed until well combined. Fold in the whipped dessert topping until combined. Spread over cooled crust. In another large bowl combine strawberries and syrup, gelatin, and boiling water. Stir for 2 minutes or until gelatin is dissolved. Carefully pour over the cream cheese layer. Cover and refrigerate for 4 hours or until set or up to 24 hours. Cannot find frozen strawberries is syrup anywhere. Can I substitute fresh strawberries that have been sugared and left to make their own syrup? This is a deceptively tedious recipe to make. First, the 10-minute bake time and "30 minute prep" mentioned does not adequately represent the true hour and a half prep time prior to refrigeration. You need time to allow the crust to cool, and the mixing and boiling and folding and spreading does not add up to 30 minutes unless you're bionic. Second, it's next to impossible finding frozen strawberries in syrup, so the day before you plan to make this, you must prep your fresh strawberries by slicing then refrigerate with enough sugar to create a syrup (I used 2 pints of strawberries and 1/2 cup sugar). Making the crust was easy, as was the cream cheese filling; but be warned that the crumbs from the crust will lift into your filling if you attempt to spread it. So I evenly placed dollops along the edges of the pan, in the corners and on top, all the while carefully smoothing it onto the crust with my fingers. 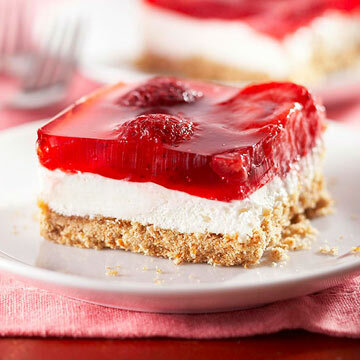 The recipe tells you to "carefully" pour the strawberries and jello mixture over the cream cheese; that is an understatement! Pouring slowly out of my large mixing bowl, the liquid ran down the side of the bowl and made a nice sticky mess on the table, the floor, and me. Even though I poured slowly, the cream cheese mixture still managed to lift up into the jello so it looks spotted; and the liquid oozed down the sides of the pan obliterating what I would have expected to be the nice appearance of 3 distinctive layers, as per the photo. And it is HEAVY to carry to the fridge. The 13 x 9 x 2 pan will be filled to the top, so it will take a steady and strong hand getting it into the fridge. So for prepping this tedious recipe, I would give one star. Let's see how it will taste this evening. I found this recipe to be fairly simple it turned out great I found that putting the pretzels and food processor and turning them into powder work the best. The strawberries in syrup I find in most all grocery stores.. They usually come in a tub or a Square container in the freezer Department. they don't actually say in syrup they just say strawberries in sugar.